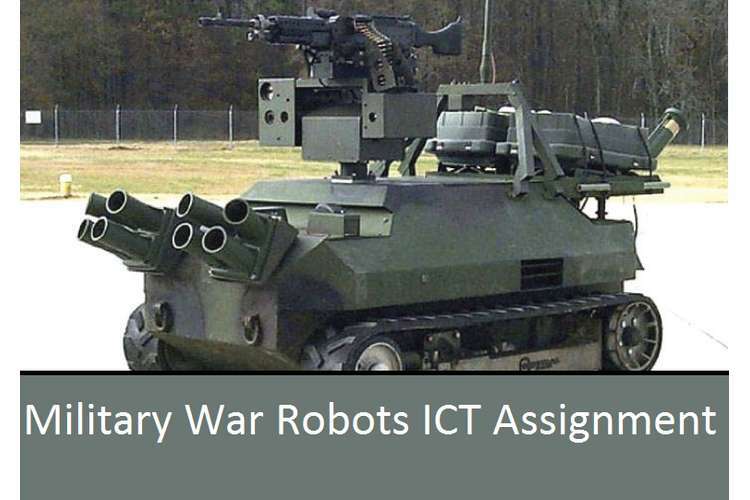 This Solutiuon of Military War Robots ICT Assignment in which explain information and communication technology used in military autonomous robots. The augmenting application and burgeoning information and communication technology use has experienced an uprising and has attained support by means of manifestation and advancement of novel computer technologies. The techniques and approach of making use of the accessible information has caused some ethical and moral dilemmas, which are acts that are ethically questionable (Williams, 2013). In some of the years in the past, people’s everyday lives have gone through a conversion and revolution by internet being introduced. This was a prevalent accomplishment in the sector of ICT. Internet is a remarkable mode for interconnecting computers. These kinds of developments in the field of information and computers carry with themselves certain ethical dilemmas as well, with the various benefits, which they are meant to offer. One of the prevalent and currently discussed sectors, where questions of ethics are being debated is Robotics. Robots are designed mainly for carrying out intelligent interface with the environment. In many forums, it has been stated that there is great influence that robotics will bring to the lives, and this impact would be more or less be the same extent that has been done by the internet (CCC, 2013). The groups which will be impacted are the army, the general civilians, the other countries, and the manufacturers as well as the approvers of the use of these war robots. The groups may be benefited by these robots since they would save several lives by replacing lives of people in the tasks that are very dangerous. However, there is threat of more wars and of various unexpected and undesired killings that may be done by these robots if they select targets themselves or malfunction. In case of disagreement, an unacceptable incident of harm can occur. There should be commitment, mutual trust, and integrity between all stakeholders. There should be clarity of the purpose and the features hat should be incorporated must be agreed upon by all the stakeholders. Realistic definition of scope is required, which should be based upon professional designing, prioritising needs ethically, and there should be ongoing support provided to the users. It is important to understand the actual needs of the war robots and should be maintained with best possible quality. It is significant that the rules and regulations that are robotics related are improved enough that they are capable of dealing with the issues. It is essential that laws exist to determine, who would be held responsible in the instances of any unexpected or incorrect results in robots’ performance. If it would be the designer, programmer, manufacturer, or the machinist who would be accountable, should be established. To allocate such accountability, there should be comprehensive logs that must be retained by the independent systems. (Leaders, 2012). Appropriate arrangements can be made for the humans controlling the war robots. Amongst all the available options, the best option that appears to be worth is that of collaboration between all the groups that are involved in the operation and functioning of war robot. They should all lay certain guidelines for the effective performance of the robot. This method would assist in checking all the possible ways and would present a war robot, which would not cause any harm. It is equally vital that the dignity, effectiveness and the honour of the ICT profession is upheld by the groups involved. This can be understood with the codes of ethics laid by the Australian Computer Society (ACS). The conformances to the values of ACS include giving primacy o the interest of public, enhancing life’s quality, competence, honesty, and professionalism. The robots’ replacement to fighters in wars would tend to violate Code of Ethics, as well as certain clauses to the Code of Conduct established by the Australian Computer Society (ACS) (Australian Computer Society, 2012). According to clause 2.2, it is important to protect the stakeholders’ interest under Primacy of the Public Interest. The induction of war robots, as of now, is unable to protect the interest of the stakeholders, particularly the stakeholders who would be present on the war field. It still demands higher level of research and lateral thinking for correcting the judgment that may have to be made by these robots in an emergency situation. As per the clause 2.3, an ICT professional must protect and defend the health and safety of those affected by their conduct. The issue with the war robots is that, in case of any kind of malfunction and disagreement, they can prove to be unsafe.. Clause 2.4 is about honesty that is required to be kept up through providing the information to public as well as the specific users, of the likely harm which may be caused by these robots so that people are aware how to manage the robots in adverse behavioural situation. There should be instant assistance in case of occurrence of an adverse event. It is apparent that the domain of war robots is still unable to meet all of the codes of conduct. This is the reason why there are stringent laws observed in this field of science. The ICT sector growth considerably affects the community and people’s lifestyle. Nevertheless, like any other technology, some negative impacts are also present in the ICT sector. It is worthwhile to approach the sphere of influence ethically and to identify and curtail the unfavourable effects. The code of conduct as well as code of ethics laid by the Australian Computer Society must be adhered to and must be re-iterated to the manufactures, designers, and users of the war robots, while simultaneously expressing the results of the violations. Information, honesty, transparency, and collaboration are the prime conducts to maintain the ethical standards of robotics. This technique of analysis is based on asking questions. The order of questions asked is very important so as to analyse the situation appropriately. Q1. What is going on? Q2. What are the facts? The war robots are meant to replace humans on the war field. If effective, these robots will save several lives. Q3. What are the issues? The death tolls might increase because of deployment of the war robots. Threat of lives of own army men and civilians. Huge cost and information technology requirement for research as well as actual implementation. Robots may be fighting robots. Being a machine, it may malfunction. Workforce required controlling these robots. The general public – There is threat of harm to lives and positively because it will tend to save many lives by fighting efficiently. The regulatory authorities – In case they are approved to be deployed and an adverse event occurs, they would lose trust on decision making. In case all goes well, they would be appreciated for the same. Q5. What are the Ethical Issues and Implications? These wars may waste several resources. Q5. What options are there? The laws related to robotics are enhanced to deal with the issues. The liability and responsibility should be set. Comprehensive training to the soldiers so as to handle the adverse situations. Approval should be required and description should be provided before conducting such activities. Q6. Which option is best? The best option is the collaboration of all the teams to lay down rules for the effectiveness and performance management of the robot. This is because, all the possible ways would be checked and the robot will be prepared so that it causes no harm in anyway. Australian Computer Society. (2012, 07). ACS Code of Ethics Case Studies & Related Clauses to the Code of Conduct. Australian Computer Society , pp. pp. 1-43.